Yarn: approx. 1/2 skeins Cascade Yarns Fixation: Sock Weight, 100 yards, 98.3% Cotton/ 1.7% Elastic (sample in colors MC: #9907 & CC: Lemon). Gauge: 8 stitches and 14 rows per inch on average. Finished sock measures 3.75″ in length and 2.5″ in height. 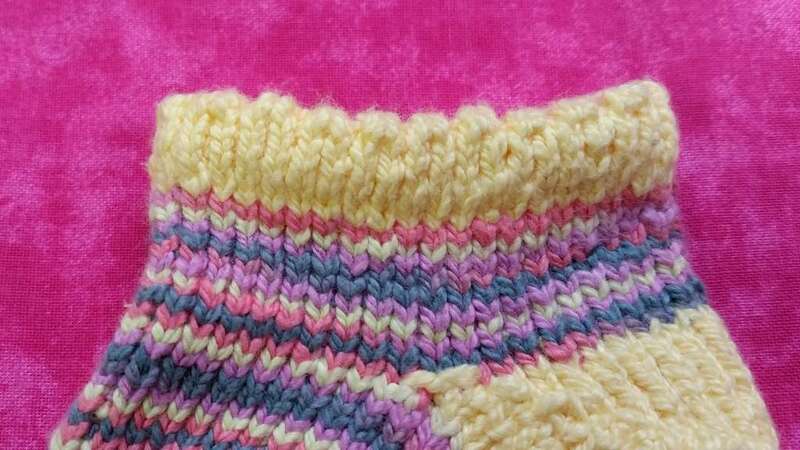 Skills Needed: True Knit Stitch or U-stitch, Double Wrap Short Row Method (shown in video links below), Chain CO, and Basic BO, Knit 2 Together. 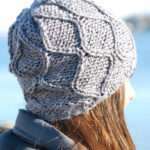 All knit stitches are either worked as a true knit stitch, or as a U-stitch. **To contact Bethany Dailey, simply submit a comment at the bottom of this post. W&T: wrap and turn- the method of creating short rows with a wrap, and then a turning of direction mid-row. Set your EFG Loom to use 40 pegs in the round. Using your CC yarn, Chain CO to all 40 pegs. Round 7: Carry WY in front of each empty peg, and K each even peg. All pegs will now be filled. 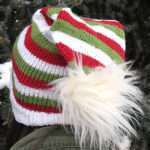 Bring inside leg of all CO row loops back up onto the loom, as you would for the brim of a hat. KO all sts. Cut CC yarn to approx. 4″. Rounds 13-22: Join your MC yarn and K. Do not cut yarn. Increase back to a full 20 pegs. 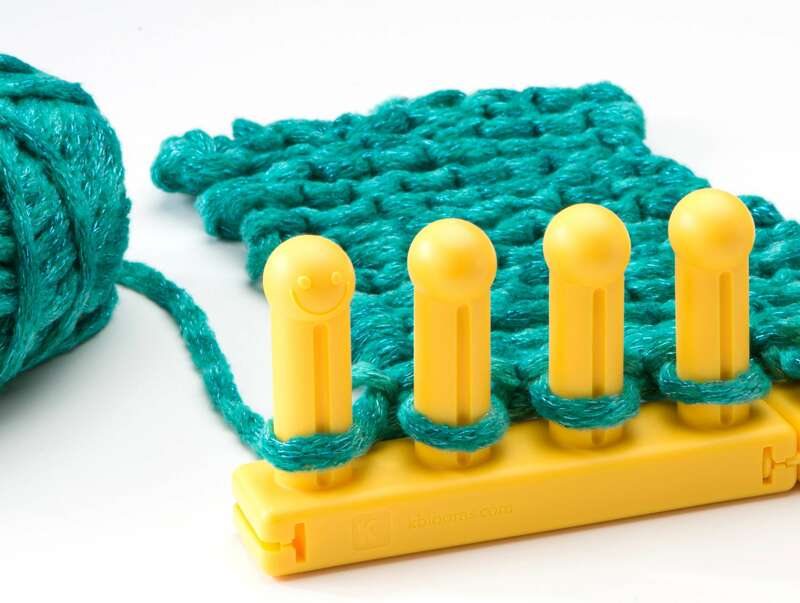 Extend your W&T’s one extra peg on each end to help close any hole created by starting the short rows. Pegs 40 & 21 will still have wrapped loops- just knit these loops together as one during the next knitted row. Rounds 23-38: Pick up MC, K all pegs. Cut MC yarn to approx. 4″. 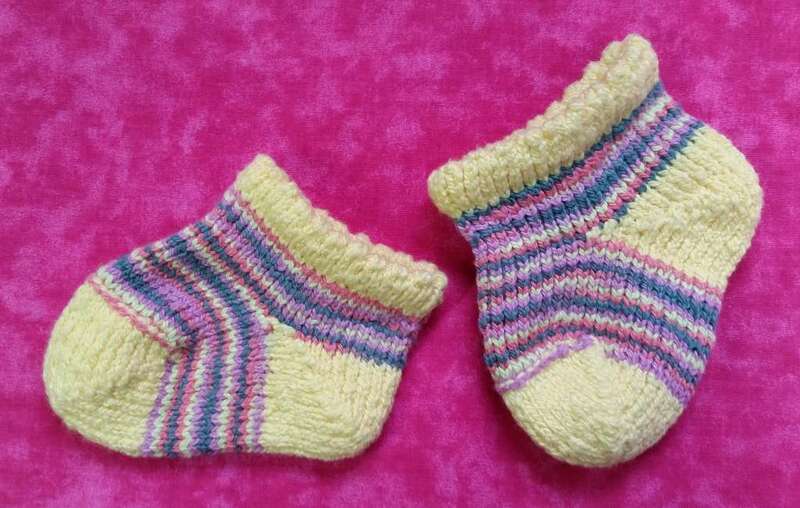 Join CC and repeat the short row instructions to create the toe. This time you will not have to extend the W&T’s one extra peg on each side. Just end the short rows when you have increased back to all 20 pegs. Weave in all ends, stretching the fabric as you go, so that the tails will stay hidden. Trim close to work. To wrap and turn (W&T): Remove the loop from the peg and hold it. With working yarn, simply wrap around the peg, then place the loop back on the peg. K7 (Treating the wrap(s) and the loop as one stitch). Lift both loops and W&T peg 15. K8 (Treating the wrap(s) and the loop as one stitch). Lift both loops and W&T peg 6. K9 (Treating the wrap(s) and the loop as one stitch). Lift both loops and W&T peg 16. K10 (Treating the wrap(s) and the loop as one stitch). Lift both loops and W&T peg 5. K11 (Treating the wrap(s) and the loop as one stitch). Lift both loops and W&T peg 17. K12 (Treating the wrap(s) and the loop as one stitch). Lift both loops and W&T peg 4. K13 (Treating the wrap(s) and the loop as one stitch). Lift both loops and W&T peg 18. K14 (Treating the wrap(s) and the loop as one stitch). Lift both loops and W&T peg 3. K15 (Treating the wrap(s) and the loop as one stitch). Lift both loops and W&T peg 19. K16 (Treating the wrap(s) and the loop as one stitch). Lift both loops and W&T peg 2. K17 (Treating the wrap(s) and the loop as one stitch). Lift both loops and W&T peg 20. K18 (Treating the wrap(s) and the loop as one stitch). Lift both loops and W&T peg 1. K19 (Treating the wrap(s) and the loop as one stitch). Lift both loops and W&T peg 21. K20 (Treating the wrap(s) and the loop as one stitch). Lift both loops and W&T peg 40. Thank you so much! I hope the babies will like them as much as we do, haha! 😉 The yarn, I’m sure, can be purchased online at the many yarn suppliers out there, but I actually got mine at a local yarn shop (not the big box store kind). I’ve actually seen them in most of those little shops that I have visited.